COMPLAWYER - A complete solution for Legal firms and individual advocates for managing all types of cases, contracts and IP Rights. COMPLAWYER makes the litigation management simpler but very effective. Email / SMS alerts makes us to never miss a case more over we can carry our data in pockets everywhere as it can be used in mobiles. As a government body our law department was having problems with defining hierarchy for litigation management. KALYATECH came up with a product COMPLAWYER with customizations that exactly suits our requirements. G: GROWTH – Foster growth for our clients, Company, Employees, Partners and Vendors. R: READY – For challenges treat every challenge as an opportunity. E: EAGER – To serve our customers every moment. E: ERNEST – Sincere in dealing with our customers. N: NIMBLE – Agile and quick to respond to a customer’s need. KALYATECH started with an emphasis on providing solutions in the areas of software application development with focus in Legal Fraternity. The company has grown to provide solutions in the domain areas of Legal fraternity, Contract Management, IP Rights, Risk Management and Process Automation serving over 300+ customers since 12 years. To grow as one of the leading IT and Services companies in providing business solutions at par with the technology. To direct the company towards sustainable success by our products, technology solutions, services and consultancy, thus ensuring growth along with high quality and value added solutions. Do you need assistance for LITIGATION MANAGEMENT? A complete package of Litigation management, Contract Management and IP Rights. Software can be accessible from anywhere, any time through Desktops, laptops, mobiles, tablets. Useful dashboards, Fact boxes and Graphs. Software is empowered with login and user management. Case dairy – where summary of each hearing can be updated. Task Scheduling – where tasks can be assigned for the advocates based on due date. Complete track of Proposal, Estimation, Expenditure and Billing. Uploading and downloading of case / contract documents. Time tracking of individual advocates. Powerful reports – Case summary report, case history report, cause list report, proposal report, task report, pending cases year wise, advocate wise, court wise, client wise etc. Renewal Dairy – where summary of each renewals can be updated. Contract fields – where user can dynamically define the fields based on the contract type. Contract reports – contract list, renewal and termination reports. 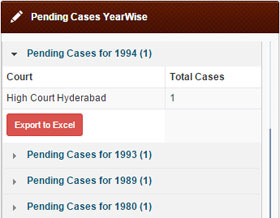 Automated Email and SMS alerts for hearings, pending tasks, missing cases, renewal and termination alerts. COMPLAWYER is a package of Litigation Management, Contract Management and IP Rights. Dashboard – Useful dashboards, Fact boxes and Graphs. Cause list for next 7 days. Simple User Friendly Reliable Affordable Software for Advocates and Law Firms. Since all data will reside in cloud, it provides accessibility to your data from anywhere and anytime. We are managing the infrastructure and platforms that run the application. No need to worry about hardware or software crashes and data loss. We are guarantying 99.9% uptime. COMPLAWYER is very much affordable to the advocates as they are paying on subscription basis.